After playing for junior side Pegswood, Black signed for Newcastle United in September 1949 and became regular member of their reserve team that played in the Central League. Black's only senior appearance came in the Charity Shield at Manchester United in 1952. 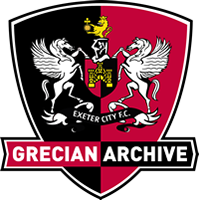 It was during one of those matches that Exeter City player-manager Norman Kirkman saw Black and was impressed with the players’ ability to score goals as well as make them. Exeter had to move fast as Stoke City were reportedly interested in signing the player, but Kirkman got his man in January 1953, and within 24-hours of signing he was lining up for the Grecians in his debut against Torquay United in a friendly at St James’ Park. Black never fulfilled the promise he had shown though and only made four consecutive league starts for the City first team against Colchester United, Millwall, Bristol Rovers and Torquay United respectively, and at the end of the season he had moved back north to sign for Rochdale in July 1953. He enjoyed much better success there, making 62 appearances in three seasons, scoring 13 goals. After leaving Rochdale, Black returned to his native North East to play for Ashington. Neville died in August, 2004 in Northumberland, England.